Our curriculum at Glasser Preschool is designed around the concept that children learn through play. Our classroom environment encourages children to make choices, develop a positive self-concept, and promote learning through experimentation and problem-solving. Our curriculum is emergent. It results from interactions between teachers and children with both providing ideas and developing them to create attractive and worthwhile themes. Teachers balance long-range objectives with moment-to-moment opportunities based on child-teacher interactions and interests. ”Developmentally Appropriate Practice“ is the philosophy of doing the right thing for each child at the right time. Our developmentally appropriate curriculum provides for all areas of a child’s development: social, emotional, physical, cognitive, language, and aesthetic. Teachers adapt curriculum plans to meet the wide range of individual needs and interests of all children in the group. Social/Emotional Development: Children negotiate for materials they want to use, follow rules for building safety, and exchange ideas that help them expand their own knowledge. Physical Development: Fine motor skills are developed by placing blocks together to make intricate designs. Gross motor development is made by carrying large blocks. Eye hand coordination is improved by building structures. Language Development: Children increase their vocabulary when talking about what they are building. They also develop writing skills by making signs for what they have built. Cognitive Development: Playing with blocks allows children an opportunity to recreate the world around them. Children learn measurement concepts, shapes, number, order, patterns, and weight as they select, build with and put away blocks. Social/Emotional Development: Children negotiate roles and cooperate to portray different situations. They recreate life experiences. Physical Development: Children develop fine motor skills by using dress up clothes. Language Development: To engage with others in dramatic play, children use language to explain what they are doing. They choose language that fits the role they have selected. Cognitive Development: While playing make believe, children create pictures in their minds about past experiences they imagine. These images are a form of abstract thinking. Social/Emotional Development: Children learn to cooperate with each other by taking turns or working together. Physical Development: Fine motor development is refined by the use of manipulatives. Language Development: Children use words to describe what they are doing. Children also can explore words and letters. Cognitive Development: Children are using problem solving skills. They also expand their emerging math skills such as counting, seriation, matching, patterning, and classification. Social/Emotional Development: Art is a natural vehicle for children to express their feelings, originality and individuality. Physical Development: Art is all about fine motor skills. Language Development: Children often talk about what they are doing and respond to questions about their creations as they engage in art. Cognitive Development: Children use thinking skills to plan, organize, select media, and represent their impressions. They experiment and learn about cause and effect. Social/Emotional Development: From books children learn about people who are like them and who are different. Children develop social skills when they share books together and reenact stories. Physical Development: Fine motor control is developed when children use tools for writing and illustrating. Language Development: All aspects of literacy - reading, writing, listening, and speaking can be strengthened in the Reading Area. Cognitive Development: Books help children gain a better understanding of the world around them. They develop an understanding of symbols, cause and effect, and basic skills such as counting, number recognition, colors, shapes, etc. 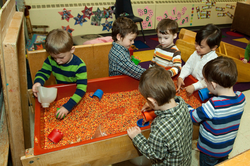 Social/Emotional Development: Children learn to work together as they explore, make discoveries, and solve problems. Physical Development: Fine motor skills are developed when they do measuring, weighing, etc. Language Development: When children make discoveries they are eager to share their excitement with others. They want to talk about their investigations, ask questions, and share experiences. Cognitive Development: Children use all the process skills when they observe and ask questions about the world around them. Children organize their thoughts by classifying, comparing, measuring, counting, and graphing objects. Social/Emotional Development: Children work together. Physical Development: Fine motor skills are developed working with props in the table. Language Development: Children expand their vocabulary as they learn words such as grainy, sprinkle, shallow, etc. Cognitive Development: Scientific exploration happens in the sensory table. Children also learn about cause and effect. Social/Emotional Development: Shared experiences make children feel part of a group. 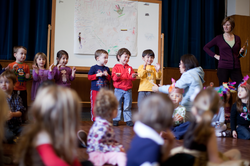 Different kinds of music evoke different feelings and actions in children. Physical Development: Gross motor development occurs with movement activities. Fine motor skills are developed when children learn finger plays and play musical instruments. Language Development: Children develop listening skills through music, following directions and print concepts when they see words of their favorite song in a chart or book. Cognitive Development: Problem solving and logic, creating patterns, number concepts (clapping), thinking symbolically, are all developed through music and movement activities.